Children smiled and welcomed Sisters into their village. 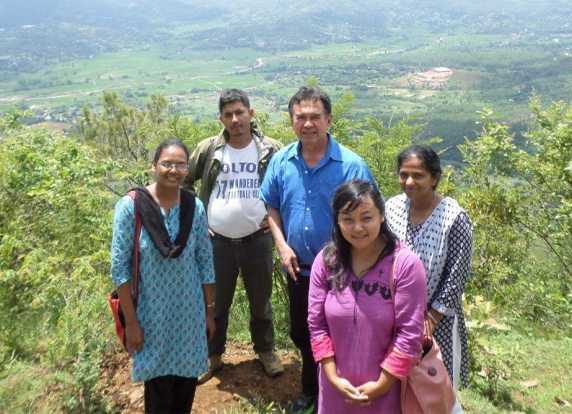 SCNs Aisha Kavalakattu and Suchita Kullu visited Koshidekha, a village which is supported by the Sister of Charity of Nazareth’s Navjyoti Center in Kathmandu, Nepal. The team visited Jhyamire and two “child friendly spaces” at Thatti and Roteping. The children’s centers at Roteping have collapsed completely so the classes now are held in a temporary shelter. The temporary learning center is closer to the forest area as it was their only option. This is a dangerous location due to the wildlife. People talked of goats being carried away by leopards from the village where the learning center is located. Losing one or two goats from the village is not a big loss, but they are extremely concerned about their children who go to the center. People pleaded for help in the construction of a more permanent school and requested the SCNs to start it as early as possible in a protected area. Continued support in all the aspects of Nepali life is a prime need, especially for the people of Koshidekha. Sisters we are trying their best to reach out to them.